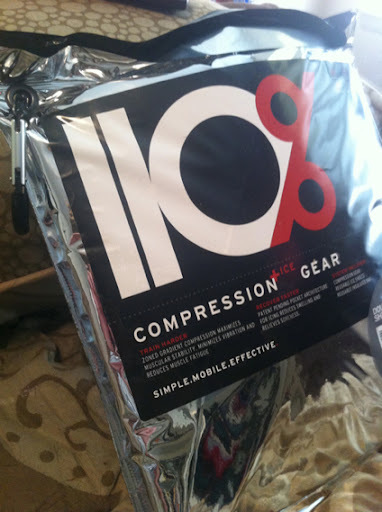 Anyone who knows me knows when it comes to compression products I have a HUGE problem!! I WILL buy it! Ha. For example, calve compression – I have CEPs, 2XUs, SKINS, & now to add to the collection, I have 110% Play Harder. Yup, I’d say I have a problem but, I’m not gonna lie there’s something different I like about each pair! Last week or so, there was a great schwaggle out for 110% Play Harder. I took advantage of it… I got the knee sleeves, the arm sleeves, the knickers, & the calve sleeves. When the box came, i thought what did i order… Well, each item comes in its own cold pack with its ice pouches & whatever you ordered. 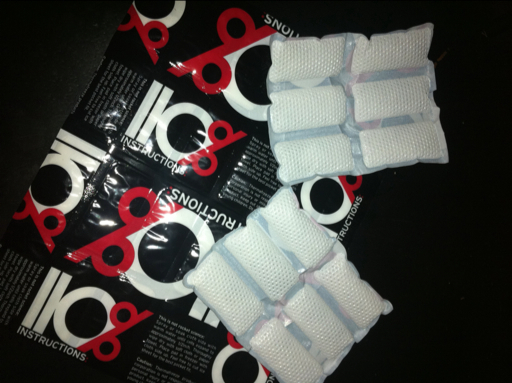 I got 4 of those… & all I could think of is how great it’ll be for post workout or races & having my ice pouches handy! Yeaaaa buddy, thats what I’m talkin’ about! But today (& for the sake of time) I’m going to talk about the 110% Play Harder knee sleeves for obvious reasons… Like that’s what’s getting physical therapy so I’m using them a bit more! When I got them Friday night, I cut up one of the ice sheets to match the area I need to do cold therapy on, ran it under warm water to expand before placing it in the freezer – I was like a little kid that just got one of those capsules with a sponge in it watching it grow! Lol. I went ahead & put the sleeve on my left knee & was surprised by the instant relief I felt – you know that feeling of aaaahhhhh – it was like a Calgon take me away moment! After the ice sheets set up Friday night, I slid them in. I like them – they’re cold, but not over-bearingly cold. One thing I’ve noticed with the ice sheets, if you continue to re-wet them when freezing them, they’re colder & last a little longer. One night, I just put them back in the freezer (no extra water) & noticed a difference. I think people tend to forget that sometimes we can use ice too much & want the cold factor to last more than an hour… Remember the 20 on, 10 off? I put them in & let them warm up on own… Usually about 45 minutes to an hour before my ice sheets are back to room temp. Also, I’d say remember everyone’s body’s run at different temperatures… My ice may last longer or shorter next to one of my friends (we’ve had discussions because we both have knee sleeves!). This product has been a huge aid in my recovery from my injury… As soon as PT or pool running is over, I pull out my cold pouch, put my knee sleeves on & ice in. I’ve learned over my first week of PT that the ice pouches are great if the gear is sitting for an hour or so by itself in the bag – over an hour, the ice sheets tend to lose some of their cool (I get into work at 7:30a & took it twice then when leaving the house, PT was at 9a. – this was bound to happen). I’ve been placing the stuff in the bag in my home freezer & grabbing it on the way – works like a gem & for me, & since it’s on the way, it’s convenient.